NOW IN STOCK AND SHIPPING! 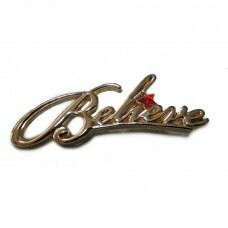 Show the world you believe, or give this pin to those that need a little extra encouragement. Designed by the Fabled Santa for Fabled Santa Industries and ToysForSanta.com, this elegant brilliant-shine 18k gold-plated pin is 2.25" x 1.25" (57.15mm x 32mm) with a pin back for easy attachment, makes a great accessory for any outfit. Not just for the Santa community, but also perfect to wear to your church events. Pin is also available in rhodium plate (silver color).